UPDATE: December 2, 2016 – According to Kernersville Fire Department Fire Chief Christopher Langham, upon arrival his department’s fire command began preparations to ascend the tower and make the recovery of the victim and they were fully capable of retrieving the tower tech, as incorrectly reported by multiple media. “We make a very strong distinction between a recovery effort and a rescue effort,” Langham informed Wireless Estimator. Langham said that the managing consultant for the tower, Al Linker from Linker Communications Services, Inc., suggested calling Sink Tower Erection Company as they have been on the tower and were familiar, as well as certified in tower rescue. “Upon Mr. Sink’s arrival, their rescue certification was verified and it was determined the most safest and quickest way to get the victim down was to allow his crew to ascend and lower the victim,” Langham said. “In rescue, we follow a much more stringent standard following the National Fire Protection Association 1670 document. We would not have used a winch system that Sink had available, but would have had to lower the victim approximately 50 feet at a time, setting and resetting our lowering devices. Based on all information given and the fact that this was a recovery and not a rescue, the decision was made to use Sink Tower Erection Company. Never was it an issue if emergency personnel were able to retrieve the victim,” Langham said. “James Sink and his crew from Sink Tower Erection Company were excellent to work with and the job they did was second to none,” Langham said. 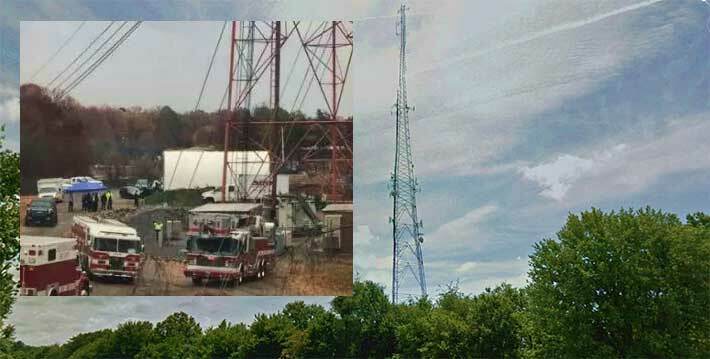 A tower tech, possibly suffering from post-traumatic stress disorder, according to authorities, appeared to have hung himself from a 450-foot self-supporting tower in Kernersville, N.C. yesterday, requiring a Lexington tower crew to remove his body from the 320-foot level when local emergency personnel were unable to make the high angle retrieval. Police received a call at 7:45 a.m. that a man’s body was hanging from a rope at the town-owned tower at 720 McKaughan St. Emergency authorities then contacted Sink Tower Erection Co. to lower the man to the ground. Company owner James Sink, who is trained in tower rescue, and also trains his men, directed tower techs Jimmy Forrest and Vance Payne in retrieving the still unnamed tower tech who worked for another company, as they lowered him to the ground. Also assisting Sink were techs Mike Wright and Billy Talley. An individual knowledgeable of the incident, informed Wireless Estimator that the man, according to a police authority on the scene, had been on the tower before, but was not servicing it when they arrived. Sink said that the man had been hanging from a 60-foot rope. “It took us about an hour and a half to get him down, because it was pouring rain,” Sink said. Sink said that as soon as they began lowering him the rain stopped and a huge rainbow dwarfed the tower site. Hopefully, a scene of solace that the troubled tower tech was finally at peace.